The A.V. Club has covered television episode by episode in our TV Club section since the fall of 2007, an unforgettable moment in broadcast history that introduced audiences to primetime classics such as Kid Nation, that Bionic Woman reboot, and the 2007-2008 Writers Guild Of America strike. Shows would air new episodes once a week (or so), and we’d post the reviews on the same schedule. Easy. Then Netflix showed up to the original-content party and started releasing full seasons of shows like House Of Cards and Orange Is The New Black all at once, with other streaming services following suit. We tend to publish reviews of these all-at-once releases on a comparatively relaxed pace—twice a week or so—because we still think it’s valuable to take our time with in-depth criticism even when the episodes arrive in concentrated bursts. But we also value another critical part of the TV Club experience: Watching something at the same time as thousands of other people and then coming together to weigh your impressions against those of A.V. Club critics and your fellow readers. So we’re going to take a double-barreled approach to this weekend’s releases of Marvel’s Jessica Jones (on Netflix) and The Man In The High Castle (Amazon Prime). We’ll post brief reviews for binge-watchers as quickly as our writers can muster. Then, in the weeks to come, we’ll publish more in-depth reviews for those who consume TV—and TV criticism—at a more relaxed pace. On the binge-watch beat this weekend, intrepid A.V. Club correspondents Caroline Siede and Shelby Fero will tackle all of Jessica Jones and The Man In The High Castle, respectively. We invite you to join Caroline and Shelby as they work their way through the first seasons of these shows, posting quick, conversational reactions to each episode, starting tomorrow, November 20, at 6 p.m. Eastern. 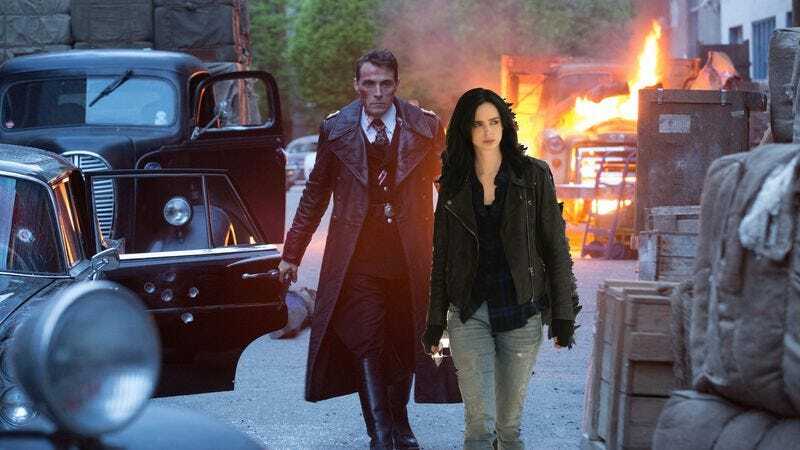 On the relaxed-pace beat, Oliver Sava will cover Jessica Jones, and Scott Von Doviak will take The Man In The High Castle. Oliver and Scott’s coverage will be the longer, in-depth reviews you’ve come to expect from TV Club, and they will post twice weekly through the end of December. Both writers will post a premiere review tomorrow, with the remainder posting on the following schedule: Mondays and Wednesdays for The Man In The High Castle, and Tuesdays and Thursdays for Jessica Jones. We’re looking forward to this little experiment in TV criticism, and we hope you’ll share in our enthusiasm. At the very least, we hope you’ll be there to support Caroline and Shelby—these are some dark TV worlds to occupy for an entire weekend.